Rick Ross has a recent book release that may interest you. 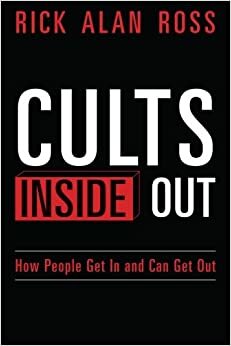 It's called, Cults Inside Out. I will add it to my WorldCat resource list as soon as it gets listed there. desperately want people not to know will become more and more widely known. Tick tock tick tock. Going Clear and all the hoopla surrounding it triggered a Scientology dream. In this one I was a Scientology staff member . . . aGain! . . . I hate those dreams. more money into Scientology so it can flourish and prosper even more. more and more, its people tend to flourish and prosper less and less. are all out of Scientology. I haven't done this for a while and never before like this. So this is for them. be disparaging to someone not in Scientology who is an expert with red crayons. "Deeply immersed" or "deeply entangled" is more accurate than "highly trained." Wieber wrote: Going Clear That was a dream but I will wager a triple latte with some booze in it that Scientology is having meetings like that and that Scientology is putting on major registrar pressure for people to put more money into Scientology so it can flourish and prosper even more. We all know that Scientologists flourishing and prospering is irrelevant compared to keeping stats up. Odd factoid: There's a group in Idaho/Utah associated with drug rehab called "Theta Wellness" that appears on the surface to NOT be Scientology or Narconon related. It bathes the patient in light inside a "Theta Chamber" which is not a Scientology practice. It doesn't appear, despite the "Theta" name, to be run by Scientologists, because they have a real psychologist on staff. They have some articles supposedly supporting their claims. I doubt they know how infamous the "Theta" term is. Wieber wrote: That was a dream but I will wager a triple latte with some booze in it that Scientology is having meetings like that and that Scientology is putting on major registrar pressure for people to put more money into Scientology so it can flourish and prosper even more. You can bet on the fact that these meetings occurred after the documentary came out. And you can bet on the anxiety was way up above and beyond the usual anxiety level. I'm sure staff were forbidden from watching that film, and that public were told the same thing. That's what I call religious freedom! is to take his sizes for zeroes. So, all orgs ideal by 2016 and we mean it. Donate now! To LRH! Hip hip . . .
Fast joke, forget the setup and go right to the punchline. Also - invoking Godwin's law. Hitler had a real navy. This song is for those who have been on staff in Scientology and have since left Scientology. Don Carlo wrote: Odd factoid: There's a group in Idaho/Utah associated with drug rehab called "Theta Wellness" that appears on the surface to NOT be Scientology or Narconon related. It bathes the patient in light inside a "Theta Chamber" which is not a Scientology practice. It doesn't appear, despite the "Theta" name, to be run by Scientologists, because they have a real psychologist on staff. They have some articles supposedly supporting their claims. Named on the website: Dr. Bryan Turner, MD, Dr. Martha Southwick, NP, Dr. Andrew Peterson, DO, and Jessica Dieters, MS, LPC, CMHC (the psychologist). "Theta" is the name of a letter from the Greek alphabet. CoS do not own the name, Theta. Of course anyone can use the term theta, but this health clinic is naive about its Scientology implications.